Trouble is I have never replaced head bearings and I haven't got the first clue about doing the job. 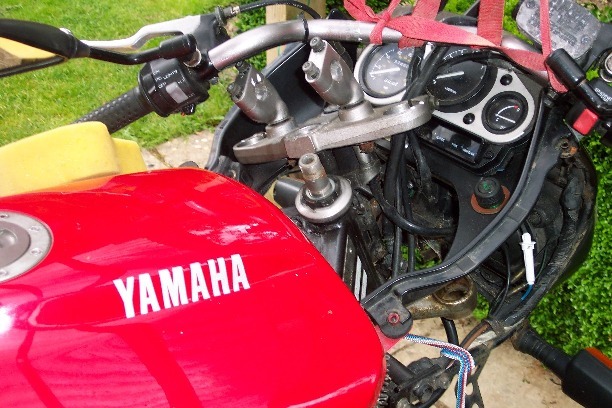 Had a look at the haynes manual last night and it looks quite complicated what with having to remove the fork legs etc. Can anyone on here advise how difficult the job really is? Would I need to get a paddock stand for the front? Kind of depends on your mechanical skill set and having the correct gear. 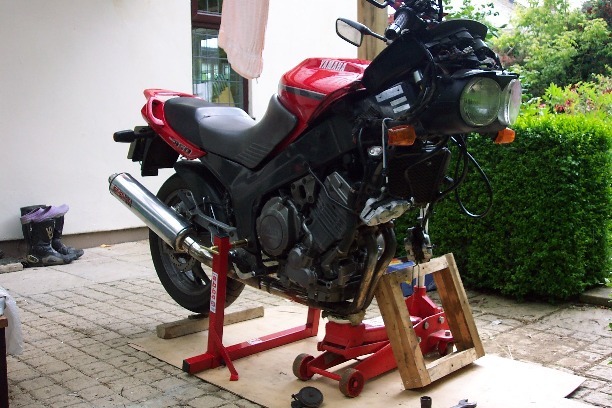 You can get the races out / in with fabricated & improvised tools but it could be a challenge. The forks have to come off and you have to find some way to support the bike while you work. Outside in one day? Possible, but I would save yourself the hassle and spend the money. Indoors would be a different story. If you were totally confident you wouldn't be asking the question, and if you're not I wouldn't attempt the job. Are you sure the head bearings are passed their ubd? Mine was notchy becase someone had over-tightened it!!! Bearings are about £30 worth, so garage is charging you about £90 labour....3 hours work?....I'd say that was fair....I'd also ask for the ole bearings back (including races) to make sure they haven't done a sly one and only changed the rollers. EDIT: Dunno if I'd fancy doin bearings out in the road. This is the kinda job where the Abba stand or similar saves you a whole load of faffin arooond trying to support the bike. The tools I needed were large hammer, Abba Stand, Pry bar (or any tool with strong large flat face), freezer, 30/31mm socket and ext bar (for driving out old races), bottom section of an axle stand (perfect diameter for driving on the lower race) and a homemade puller to pull the races in straight. Stuck races in freezer overnight...not sure it helped much but hey. 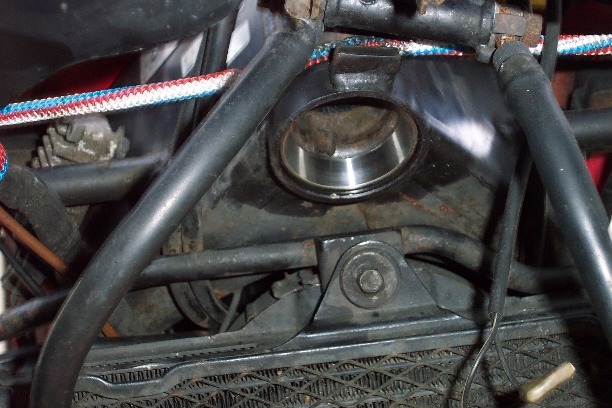 Also should say axle stand bases used to drive on lower BEARING rather than lower race. ANYWAYS: mkI cornering at low speed (below 35mph) there is a very noticeable wibbling in the steering......the steering feels heavy, then light, then heavy.....I realise thats a crap description, but its the best oi can do. At higher speeds handling is fantastic, no probs at all. This may (or may not) be linked to a juddering under heavy breaking (which is either warped discs or as AE suggested, not centralised discs). Did the obvious thing and checked tyre pressure. I checked the head bearings when the front end was off a few months back (and the boike has recently passed a meticulous MOT test inspection).....though this sounds loike the most loikely. Only other thing I could think of is a slightly binding caliper (or warped disc pulling the boike)....though neither of the fornt discs are generating excessive heat. Lower 55 x 30 x 17 (ask for the one with a rubber bearing protector). Both bearings are standard sizes and can be found at most bearing retailers. Removing the borrum race from the frame is fun. Rather than using the Haynes method of using a drift from the top, I found it easier to insert prybar from below into the lip on the race and then feed down a 30mm (or 31mm) with extension bar through the stem and tap (whack) on the pry bar face. That way you don't need to press on the upper race at all with the drift and can tap evenly all the way round. A few pics to go with the above threads. Using your fantastic Abba stand B) (Beany), get it oooop in the air and remove all the dohickey and jobbywobblers as specified in the Haynes manual (section 6). Forks, steering stem etc. I decided to support the bars from the roof rather than remove all the cables or let it rest and stress the cables. You won't see a smile on the face of this race! As mentioned by Stink-Feet, the old races are a real burger to remove if attempting to use the Haynes method (see p 6.18 illustration 9.4)...two problems.....you are resting on one of the races whilst trying to remove the other....not overly clever....and also the indents left for driving the race off are tiny (as seen in pic below). After offering everything up using the Haynes method it just WAS NOT going to work.....so I placed a pry bar face on the lip of the old race (from below for the lower race) and then passed a large socket (30/31mm) with bar through the stem to use as a drift....but STRAIGHT DOWN onto the face of the pry bar rather than resting on the opposite race as shown in Haynes. Worked a treat....stopping occasionally to move the position of the pry bar and check that its coming out straight. The new races were pressed into position using the drawbolt method in Haynes (p6.18, illuatration 9.6), worked fine. 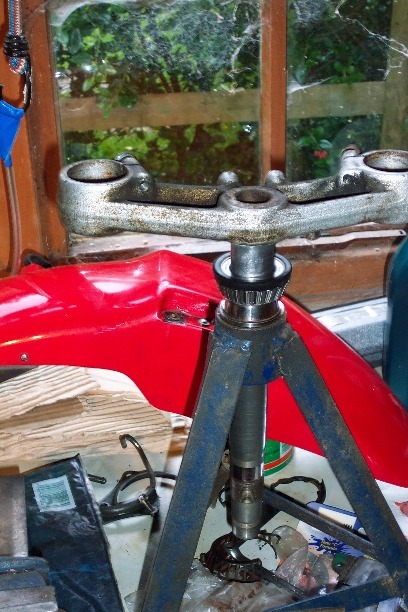 Removing the old inner bearing from the steering stem requires a bearing puller......or a similar home made attempt..it is tight (unsurprisingly)! To drive the new bearing on I carefully (hrumph) removed the rollers and cage from the old bearing and used the remains as a perfect sized bearing driver. My axle stand body had the perfect diameter to support to whole shebang while I walloped it good! Can't remember much else (it was a while ago). I do remember it took me a while to be happy with the setting on bearing tightness on install....but I'm a fussy burger. I would have to have a mechanic do something like this... I am not very mechanical. What about somthing simple for the likes of me.... like how to 'properly' tighten the steering head? bet the missus flipped about doin it in the garden ,lol.just by chance brother what was the sizes in metricas iam going to do mine while she is in bits ''am postin up the pics tomoz so you all can roll round the stocks & tell me how silly& madder iam with jack up set up '''' ! more than my kids& judy have rofl lmao pmsl,but seriously bruv i would appreciate the sizes ,.s forgive me gramar am a lidexsik errasoll sorry! Tenacious have a feeling you aint takin any piketures today until the sauce has worn off. What sizes in metricas did you require? woooooooooof have i got a herad on me dapleb.i know am right articulate alchy on bank holiday tuesday m8 lol. metric i think i meeant rofl 'sorry ',erm i think i need the sizes or the numbers so i can get ntn or koyo bearings with said numbers as a reference dap.must appoligise ithink i can spell when am drunk,cant do properly sober lmao. Edited by TenaciousTdM, 26 May 2009 - 12:10 pm. Nice wan thanks for the info Z900. Do you have any comments about good/bad manufacturers in terms of quality? Sorry I dunno em. Some clever part number bod on ear will though Im sure. Photos reinstalled from gallery bodge back into initial post. 1. There is a "Rubber washer" part #10 on the WSM diagram p4-65 (attached), between the ring nuts. Does this need to be replaced when checking / lubricating / adjusting the head bearings? I do not see any New label but the collective's experience and advice is sought. 3. 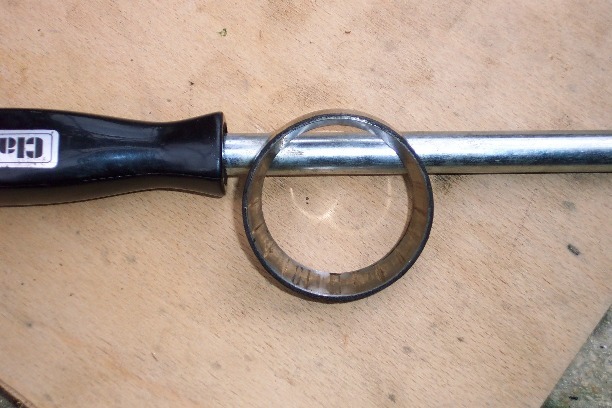 What is the torque to secure the "Upper ring nut" #9? - I can't see any spec'n. except the "finger tighten ... then align" on p3-30. Is that sufficient? "Thank you" if you reply. PS Why can I not attach .docx files from Word, only .doc versions? Edited by steve27bha, 17 February 2015 - 07:36 pm. OK, what height to set the forks above the top clamp?